Home / Furniture, bags etc. Portable furniture includes tables and chairs for exhibition stands, workstations for exhibitions, counters and plinths and lecterns for exhibitions. Queue guidance systems also come in this section as do drums, cases and bags Lights and accessories for display systems are also here. Brackets, TV stand, tools, shelves, cable management, clamps, feet, adaptor clips. Portable, flat-pack counters and desks. 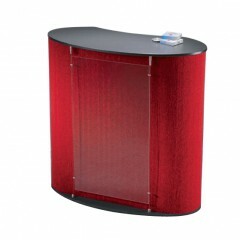 Promotional, outdoor and fabric counters. Folding display case. All can be graphic-covered. 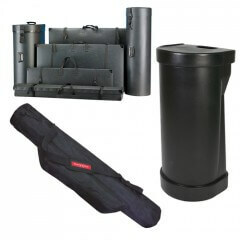 Wheeled cases, carry bags, holdalls, zoom tubes, graphic cases, transit cases, lighting cases, Curvorama cases. 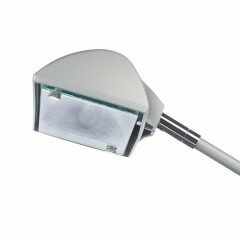 Lights for pop-up stands, banner stands, Curvorama stands, fabric display stands, backdrop frames, gantry etc. Bags, cases, lights, furniture, accessories..
Furniture, bags and Accessories is a category that includes Counters and workstations as well as plinths and lecterns, lights and guidance systems. With 25 years of hard-won experience, Fresco sells tried and tested products at the best possible prices. Our products are all backed up by helpful support and a reassuring guarantee. As well as selling a comprehensive range of portable display systems Fresco designs and manufactures display stands and shell scheme liners. 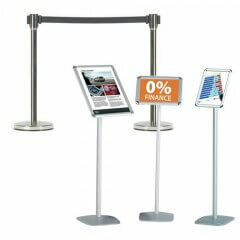 Our display stands are complimented by premium display print. 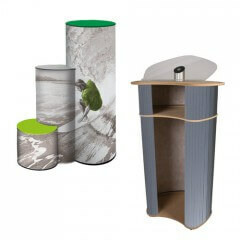 Many of our counters and plinths can carry eye-catching graphics. Send us artwork or take advantage of our design service. Or, just send us resources (logos and so on) and we will artwork them for you. This is a very cost-effective option. 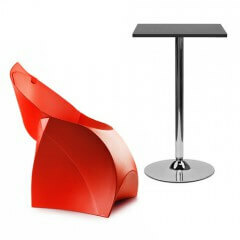 Whatever suits you, you will find Fresco a pleasure to work with. We also offer free technical support for your own designers to produce display artwork that will print perfectly. This helps us and it helps you. Fresco also bends over backwards to make sure your display gets delivered on time, every time.